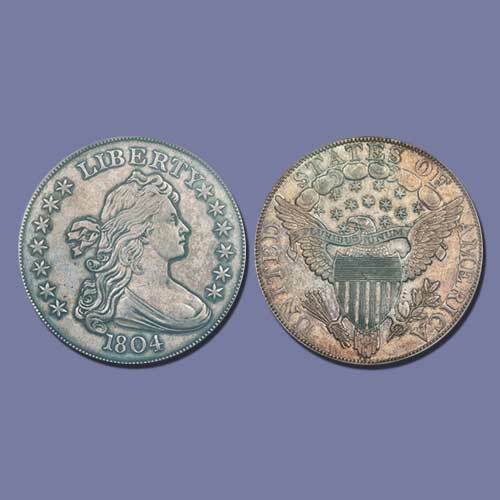 Heritage Auctions sold a Mickley-Hawn-Queller 1804 Draped Bust dollar graded Proof 62 by PCGS for $2.64 million on 14th June during the Long Beach auction. Only 15 such dollars exist today and the offered coin is one of the eight Class I dollars. The same coin was sold for $3,877,500 in August 2013 in Chicago, and for $3,737,500 in 2008. A 1797 Draped Bust, Small Eagle silver Half dollar graded AU 55 by NGC was sold for $150,000 by Ira and Larry Goldberg Auctioneers on 10th June. A 1792 Roman Head “cent” token graded Proof 65 red and brown by PCGS with a green CAC sticker was sold for $108,000 by Bonhams’ on 11th June in Los Angeles. The same coin was offered by Heritage in November 2014 as a part of the Eric P. Newman Collection and was sold for $102,812.50. George Washington did not want his face on coins but an image of the president of the US was required on coins as per a new Act. The coin was produced in England by the Birmingham Mint. The act was later changed to include an emblematic of liberty on coins. Walter Breen wanted to portray Washington as a degenerate, effeminate Roman emperor, but others depicted him in the classical tradition. Only 20 such coins exist today. Well-worn examples are costly. A Very Good example was sold for $18,000 at a Heritage auction this year. A unique 1792 Washington gold coin would be offered by Heritage on 16th August during the Platinum Night auction. The coins were struck for Washington as a pattern for a gold $10 eagle and were carried by George Washington. Experts believe that the coin was struck at Massachusetts and not England. The coin was privately bought in 1942 by Newman and was last auctioned in 1890. The finest-graded 1913 Liberty Head 5-cent piece, graded PCGS Proof 66 with a green CAC sticker, will be offered by Stack’s Bowers Galleries on 15th August at the 2018 ANA Rarities Night auction.